This book was on my queue to read for quite a while. 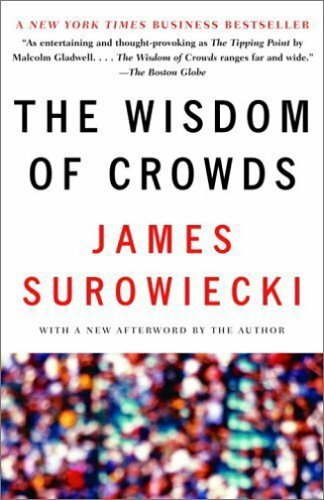 The Wisdom of Crowds by James Surowiecki was both interesting and bit long-winded. Some chapters were entertaining to me and others put me to sleep. Let me summarize the book in a single sentence. Crowds will arrive at a better answer than individuals if they gather their information independently. Now if you would like 270 pages of explanations and examples, go read the book. * The fact that well-informed crowds come to better decisions flies in the face of the absurd hero-worship that many folks in this country engage in. Just look at the ridiculously overpaid CEO’s, the idiotic investment Guru’s (Jim Cramer anyone?) and such. * How can we tap in to this amazing wisdom? We’ve only just begun to try to harness this with prediction markets and the like. Fascinating stuff for the future of all kinds of forecasting. I personally invest in a mutual fund that engages in this (Marketocracy Masters 100:MOFQX) and it’s beating the market soundly in this depressed economy. * This phenomenon should be humbling to many investors who are always chasing that next great stock tip from their cow-worker/friend/family member. You can’t win at that game. You can’t beat the stock market and it’s collective wisdom. I guess I was exposed to some of the concepts in other books I read first, which wasn’t the fault of this author. My favorite part of the book was the history behind the “bowling bubble”. It was a part of financial history that was new to me. I liked this one – Debbie’s reading it now. Also, read “Made To Stick”.